One of the “joys” of being a homeowner is that you pretty much never run out of tasks to add to your to-do list. Once one item is crossed off, another one always seems to spring up. I’ve completely resigned myself to this fact. However, there is one thing that is positive about the situation – I always have something to work on! It’s crazy to think that the 4th of July is just around the corner. 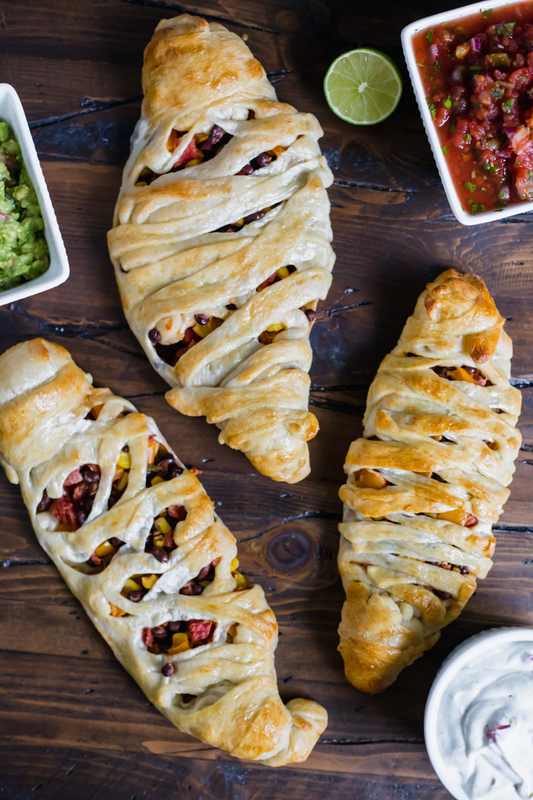 Do you have any fun festivities to look forward to? 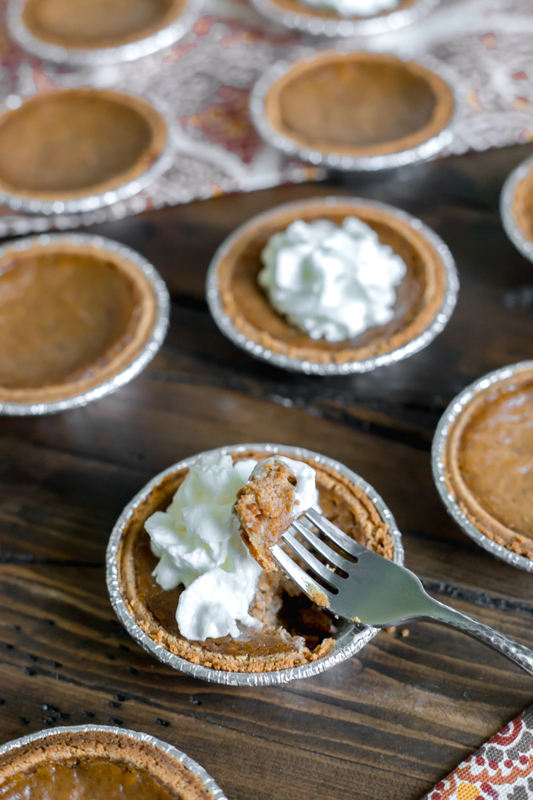 We are hoping to have guests over at that time, which always puts me and Justin into preparation mode. It just so happens that the 4th of July always seems to be one of the hottest, most sweltering times of the year in Florida. Our garage has been pretty much packed to the brim with items we are storing. There is so much sitting in there that we can’t even park both of our cars in the garage. I am lucky enough that my car fits (barely), but both of the cars?!?!? Forget about it. With impending 4th of July activities, we thought it would be SO nice to be able to free up parking space in our garage, which would leave our driveway more accessible for guests (so they don’t have to park on our street, which can get pretty busy and crowded depending on what our neighbors have planned as well). But, how in the world do you accomplish such a feat? 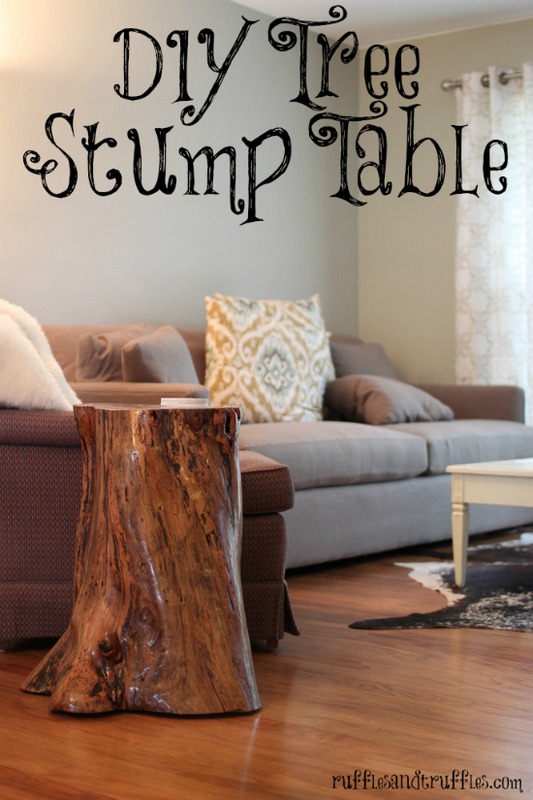 With a few handy items we transformed our garage in the span of only a weekend! It seemed pretty clear: we needed to remove items from the floor of the garage and give them a storage space on a garage wall. Although we have some shelving and cabinets in our garage, they really don’t store everything perfectly. 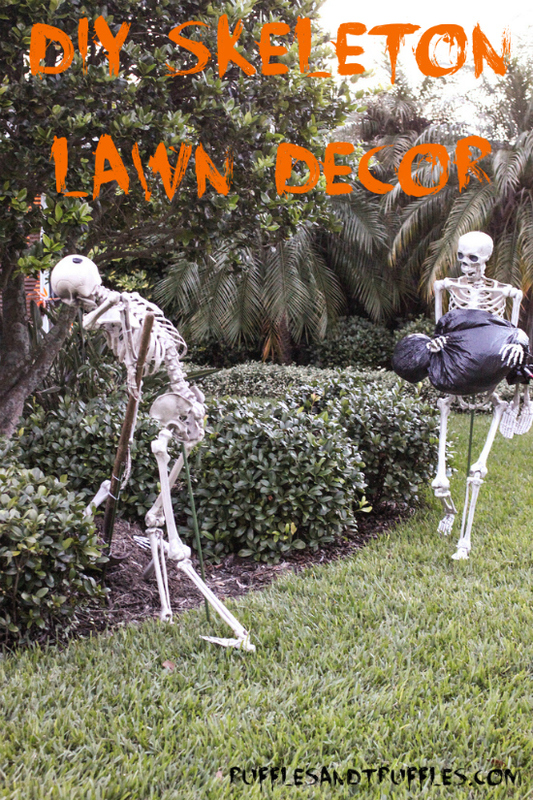 What about the lawn and garden tools? 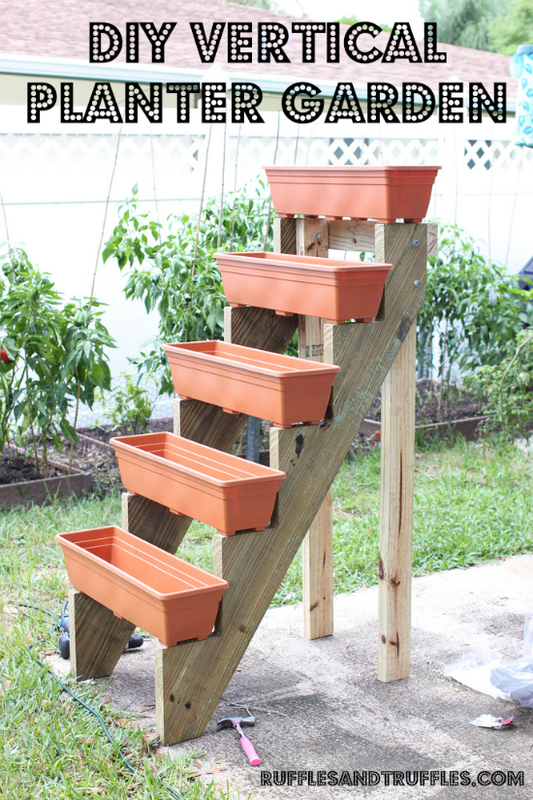 What about our ladders? The beach chairs? Where in the world do you put all of those things? 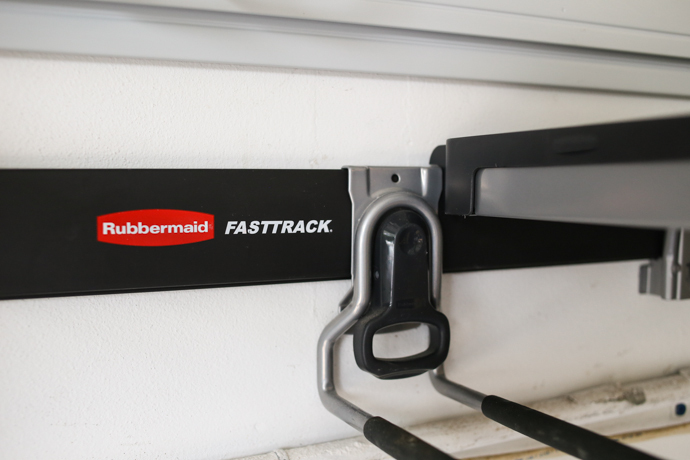 Enter: the Rubbermaid® FastTrack® system. Oh, how it has helped us take control of our garage space!!!! The Rubbermaid® FastTrack® system has so many options – we loved how you can mix and match the different accessories paired with the hang rails and wall panels to create options that completely suit your space. 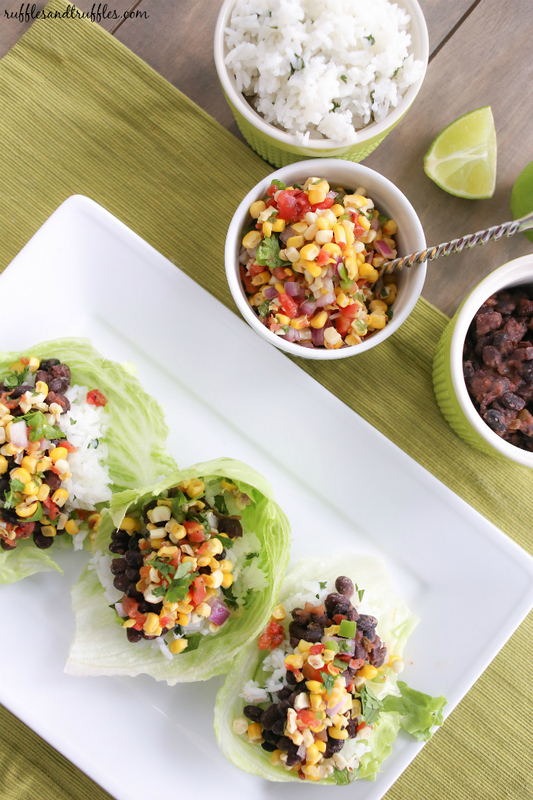 But first thing’s first: the basics! 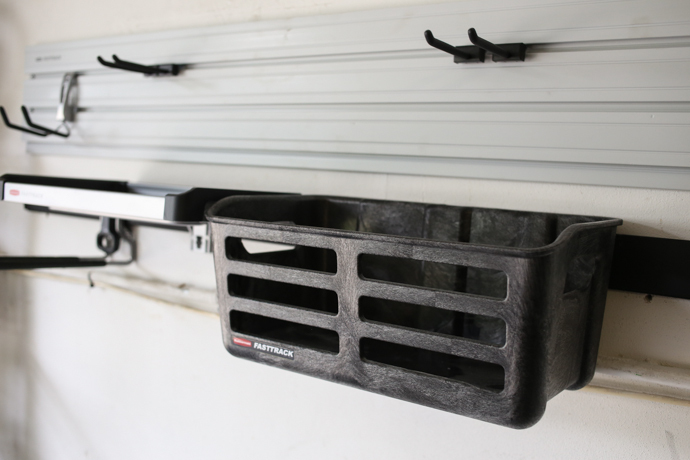 To get our organized garage space started, we picked up the Rubbermaid® FastTrack® Garage Hang Rails and Hardware Pack at The Home Depot. The items can be easily located in their storage aisle: more specifically, their garage organization section! We bought a few 48 inch wall panels, a couple of 48 inch rails, as well as the hardware packs for each of those items. 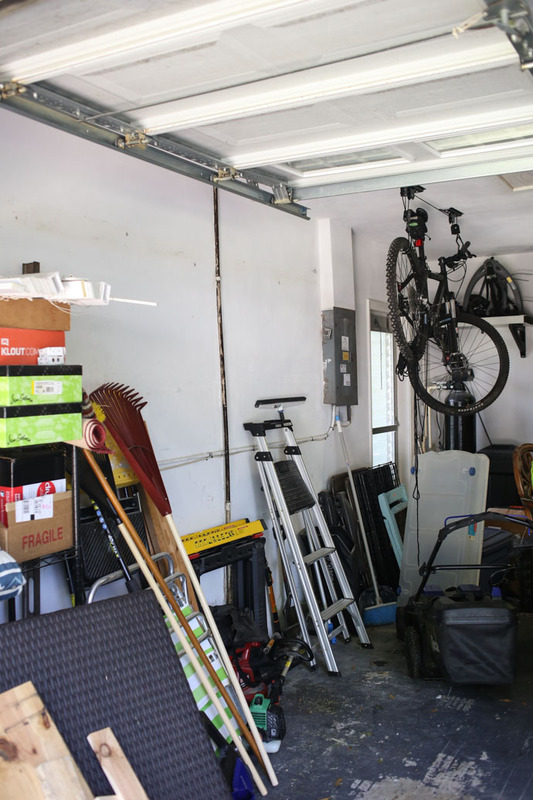 We decided to utilize the side wall of our garage for the system, as it is the largest area we have available, and would make all of our items easily accessible to us. The installation process was very simple. 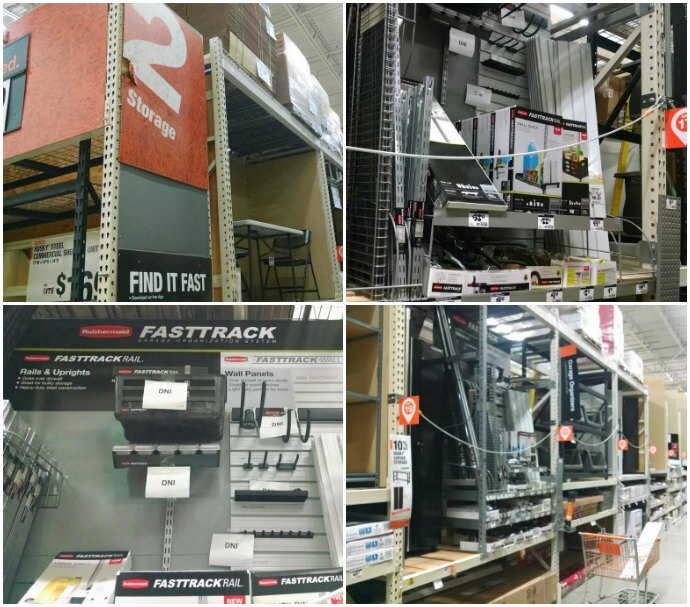 Because you can purchase the hardware packs, you don’t have to worry about scouring different aisles for pieces to attach the rails and panels with. Justin literally had everything attached to the wall in about two hours – not too shabby, I’d say! 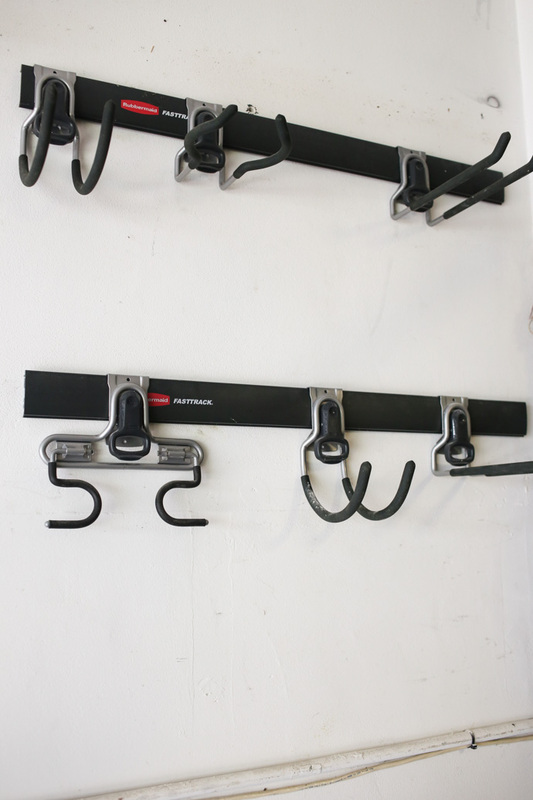 The FastTrack® Garage Hang Rails are absolutely amazing. 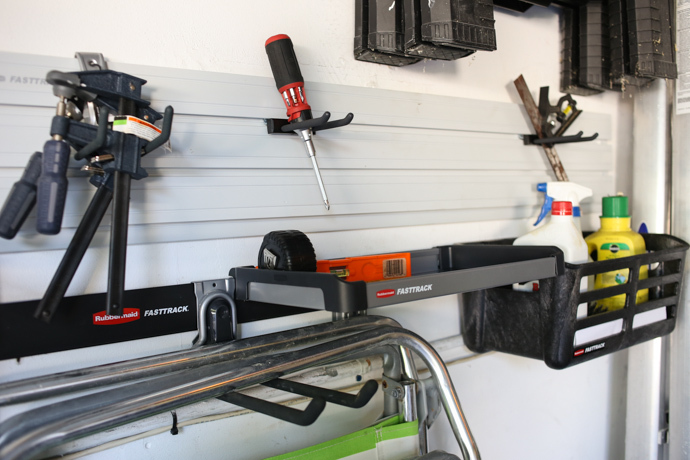 They serve as the backbone of the FastTrack® Garage Organization System. Each rail can hold up to 1,750 pounds – they are incredibly durable! 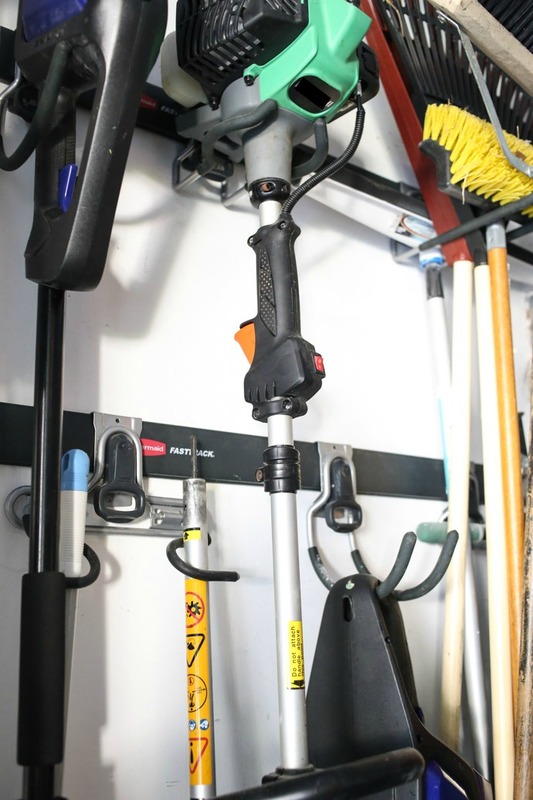 An array of attachments can be added to the rail for complete customization of your garage area. In our case, we selected some of the Rubbermaid® FastTrack® Multi-Purpose Hooks, the Rubbermaid® FastTrack® Dual Handle Hooks, the Rubbermaid® FastTrack® Garage Cooler Hook, a Rubbermaid® FastTrack® Utility Hook, two sets of the Rubbermaid® FastTrack® Large Wall Hooks, one of the Rubbermaid® FastTrack® Utility Bins, and a Rubbermaid® FastTrack® Small Shelf. We also hung a few wall panels to hook additional attachments to (with a rail underneath)! I love the addition of the utility bin and the small shelf for items that might not be able to be placed on a hook, but still need a space on the wall! 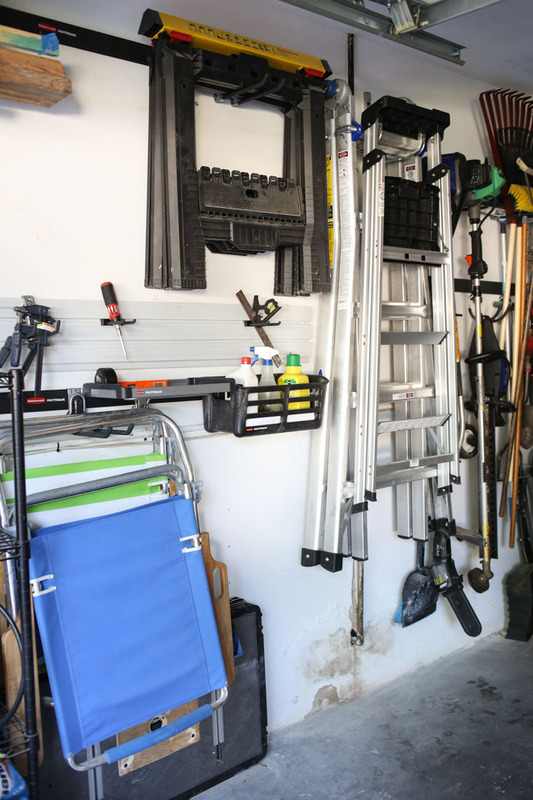 One of the other amazing aspects of this garage organization system is that you can always change things up if you no longer need the configuration you set up! Want to move the shelf? No problem…you can slide it over, you can take it off and add it to another rail…whatever floats your boat! I like knowing that I’m not penned in to one single setup for the rest of time. So, how does it all look now that we put all of our items up on the wall??? Pretty darn good, I’d say!!! 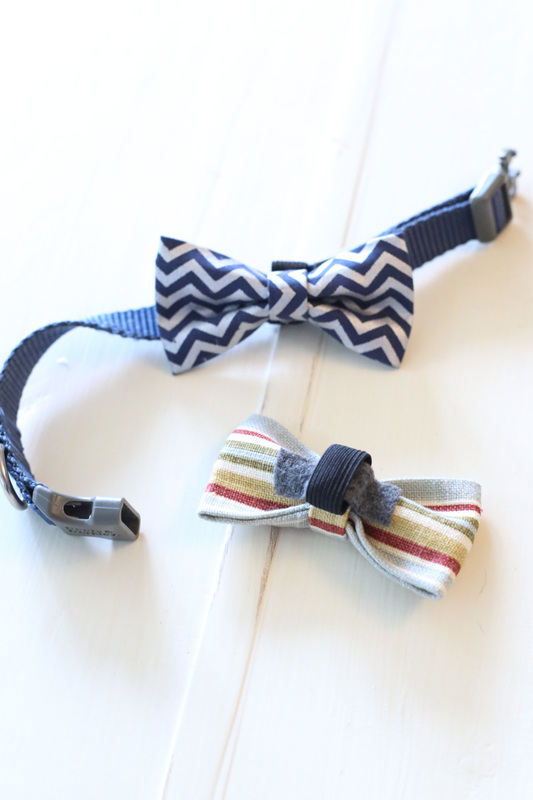 We have places to hang our beach chairs (the multi-purpose hooks are perfect for them), to store our ladder, and more! The before and after of our garage is so different (for the better), and I no longer feel horrified when I look into the garage. 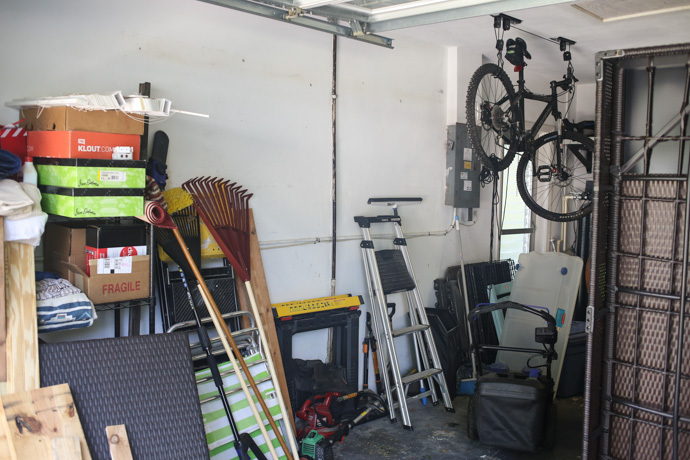 I might not even mind if some of our guests end up seeing it – when everything is organized and put in its proper place, I no longer have to feel a sense of dread looking out into our garage! 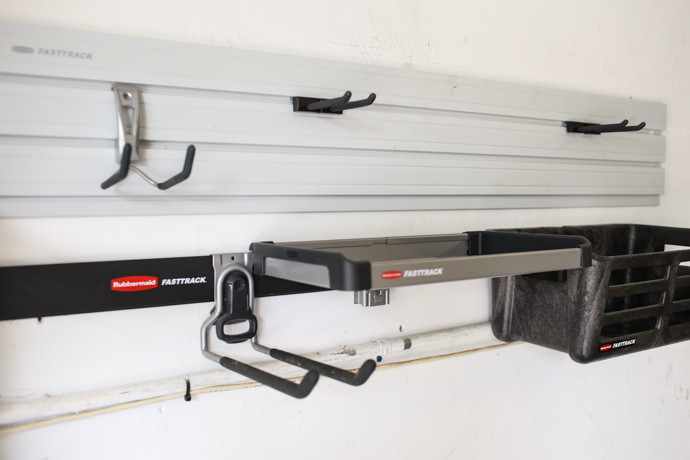 So, would you like to organize your own garage space with the Rubbermaid® FastTrack® system? How would you configure yours?